This weekend looks like great weather giveus a call to make a booking. Like us on Facebook to keep up to date with catches and special deals. Before the weekend we got a couple of trips in, Thursday was a full day charter to Caloundra wide targeting pearl perch however the run was too strong to fish the deeper water and we found ourselves further north on the bottom of the barwon banks.Â Species caught included snapper to 3kg, tuskfish, moses perch, hussar, rosy jobfish and a few pearlies made the legal size limit as well. 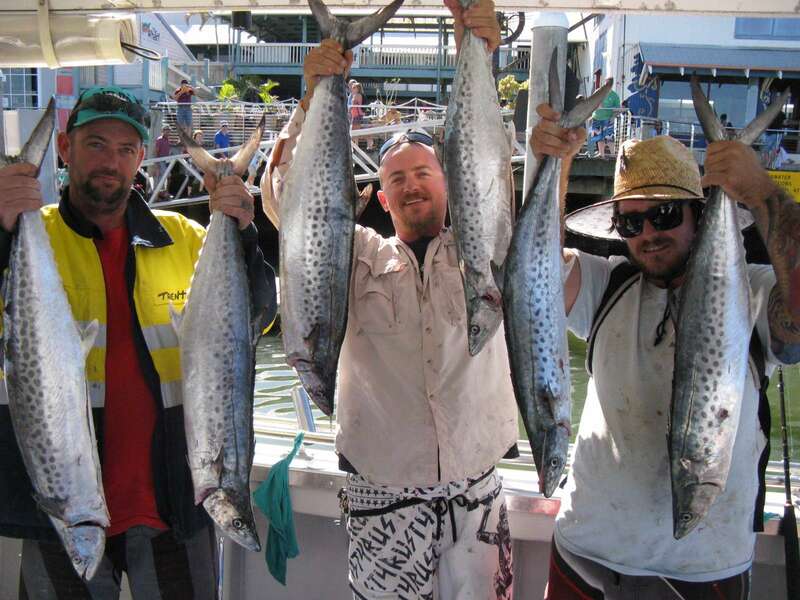 Friday was a 3/4 day fishing charter spent fishing for mackerel.Â We spent most of the morning fishing currimundi reef which has been firing for about a month. We caught lots of school mackerel between 2 and 4kg along with a few grassy sweetlip, moses perch, squire and a 11kg Spanish mackerel which put up a great fight. We headed wider after a couple of hours and put the crab gear out. We fished the Caloundra 12nm and caught a few tusk fish and squire. A great day had by all, especially Chris who claimed bragging rights with his 11kg Spanish mackerel, well done boys! To book a trip with us head over to our contacts page to flick us an email or give us a call and we will help you land your “Top Catch”, until then HAPPY HUNTING!!!! 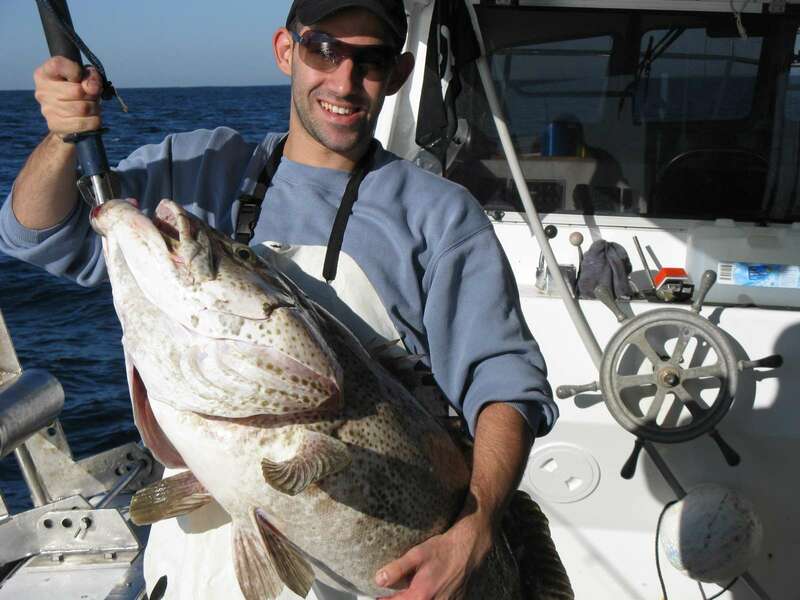 Caloundra 9 and 12nm- school, spotted and Spanish mackerel, moses perch, sweetlip, tuna and mackerel. 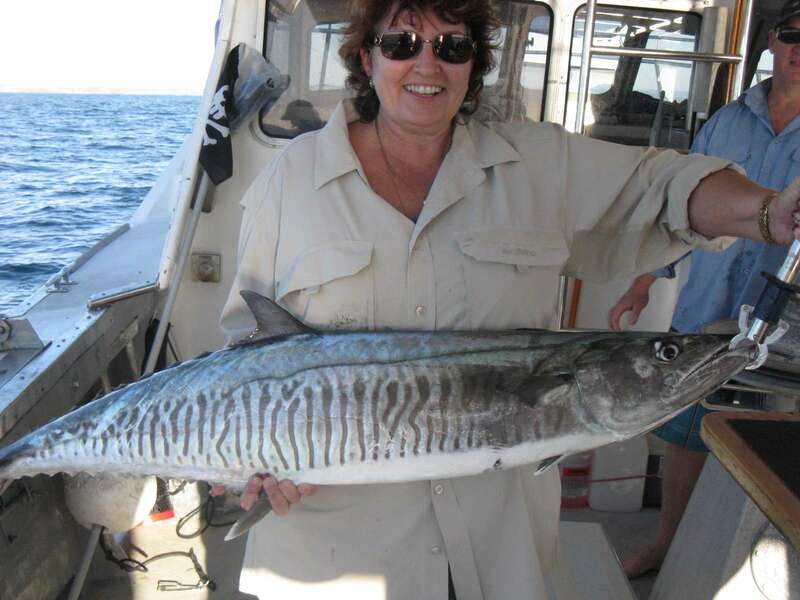 Currimundi and Caloundra 5nm reef- School , casino online spanish and spotted mackerel, moses perch, sweetlip, tuna and marlin. The weather was fantastic for another week on the sunshine coast and we got out on fishing charters Thursday through to Sunday. All fished really well apart from Saturday afternoon, looks like the early morning bite is the go at the moment. We fished in close targeting the mackerel run which has been sensational this year, lots of school mackerel up to 4kg along with a few spotties up to 5kg and Spanish up to 13kg. 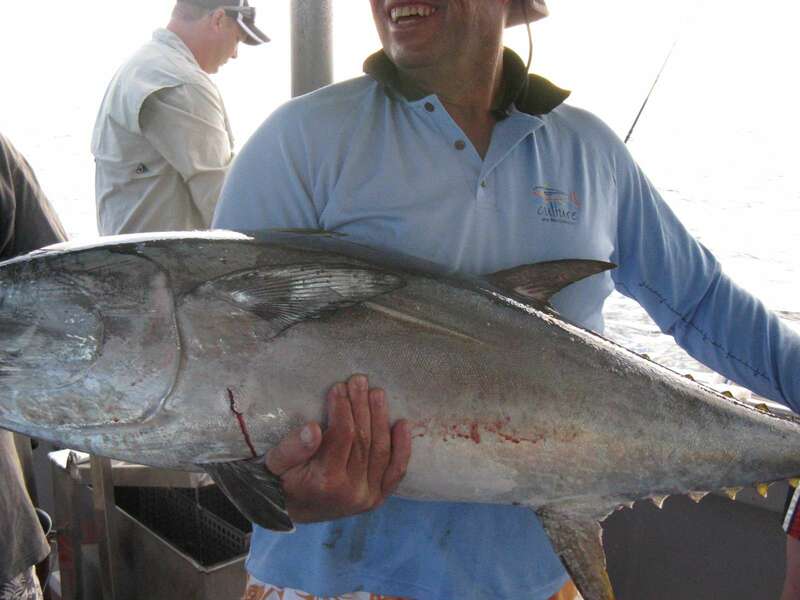 Other species included grassy sweetlip, tuskfish, moses perch, cod and even a little black marlin caught only a couple of mile offshore which is not usually common in 18 metres of water. Thursday was the best day with action going off everywhere from the gneerings down to the Caloundra 5nm. The biggest fish caught that day was a 10kg Spanish along with heaps of school mackerel to 4kg and a couple spotties to 5kg. Sweetlip and moses perch were also chewing and the little marlin topped things nicely. The other morning charters went well with mackerel making up most of the catch, everyone was enjoying the line peeling action. 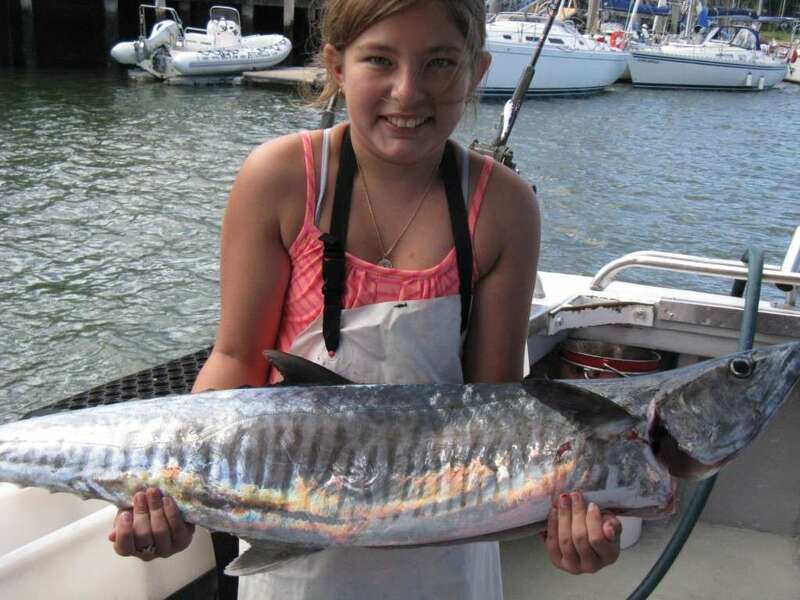 Tuskfish, stripey sea perch and moses perch added some colour to the esky but the prize fish of the weekend was caught by 12yo Tahlia, a big 12kg Spanish mackerel which she muscled by herself on her first offshore charter trip. Well done Tahlia!!!!!! We should get a couple more weeks of mackerel fishing and then we will be getting geared up for snapper season….. Can’t wait! If you would like to join us for a trip head over to our contacts page and flick us an email or call us, until then happy hunting!! We have had an awesome easter week, perfect weather and sensational fishing action especially for pelagics on the inshore grounds. The sunshine coast lived up to it’s name with clear warm days and very light winds. 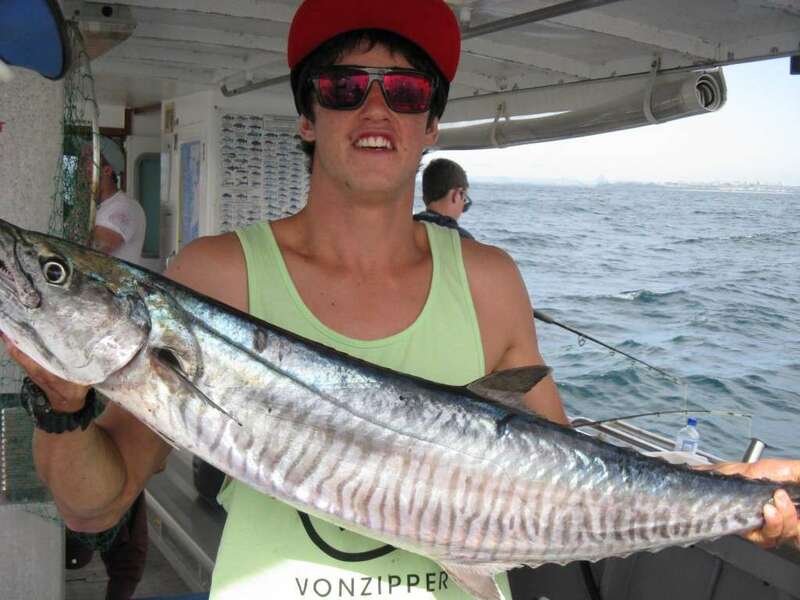 Most trips were ½ and ¾ day mixed charters spent in close taking advantage of the mackerel run. Lots of schoolies caught up to 4kg as well as plenty of Spanish too. This one weighed in at 13kg but the average was around the 7kg mark. Along with the mackerel were plenty of sweetlip, tuskfish, squire, gold spot wrasse, some huge cod up to 21kg, and some massive long tail tuna up to 24kg which put up a great fight, in shallow water, circling the boat and taking powerful runs. Bruce, one of our regulars, nailed this whoppa and was able to cross it off his bucket list. Well done mate!!!!! We did get out for a fullday to the Barwon Banks on easter Monday and caught a mixed bag of reefies including tuskfish, red throat emperor, gold spot wrasse, coral cod, fusilier, snapper and pearl perch. We had mixed results with the crabbing- some trips were great and others were a little light on but with all the fishing action not alot of time was put into it. If you want to take advantage of the weather and get out for a trip now is the perfect time. The pelagic fish that have been firing over easter should hang around for a couple more weeks and the last quarter to new moon phase is approaching which is great for fishing. With results like these you are going to have fun!!! Easter is upon us and seafood is the order of the day. The weather for the easter long weekend looks amazing for the Sunshine Coast and what better way to enjoy it than with some seafood on the BBQ. This simple dish is healthy, tasty and simple too, sure to impress whoever digs their fangs into it!!! Thought we would share the recipe for those who are looking for something different than the same old fish ‘n’ chips. 2)Meanwhile cut the fish into 2.5cm cubes. Drain the pineapple reserving 2 tablespoons of the juice. Cut the capsicum into 2.5cm pieces. 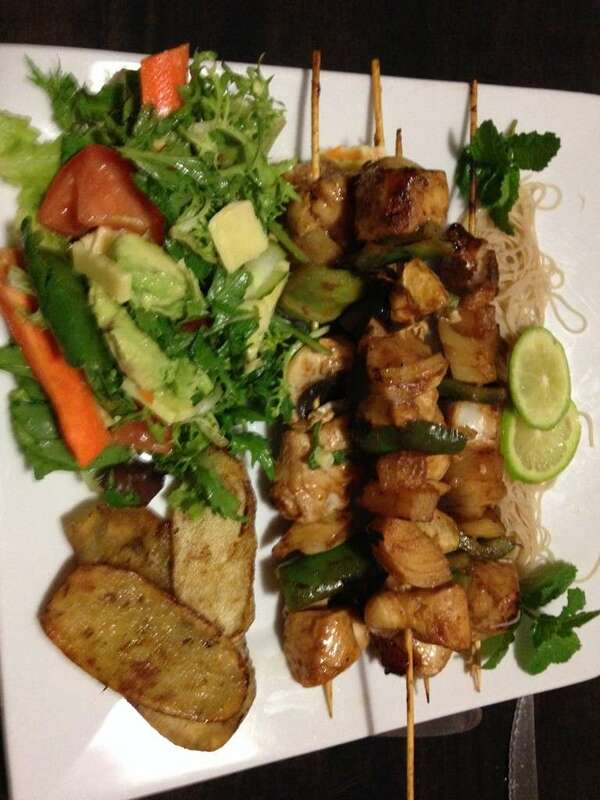 Then thread the capsicum, pineapple and fish alternately onto the skewers.